This recipe for Pumpkin Pie Biscotti is full of fall flavor and the traditional biscotti crunch. 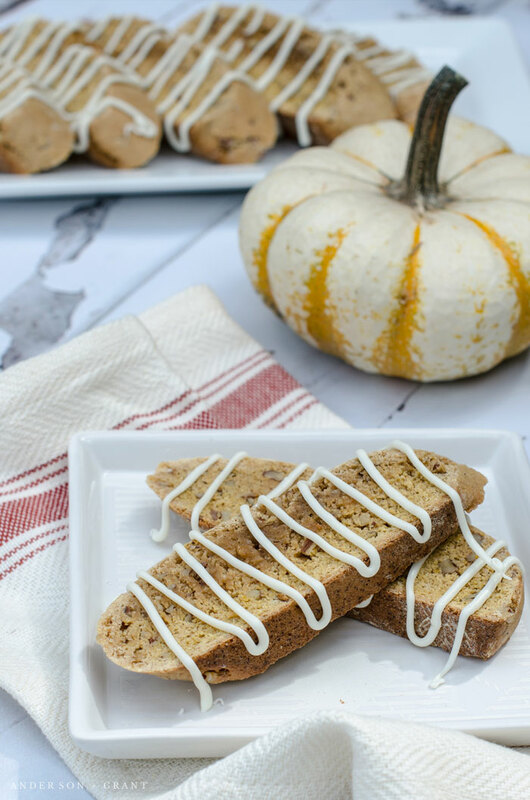 Made with a blend of toasted pecans, pumpkin puree and pumpkin pie spice, it is the perfect accompaniment to a cup of coffee on an autumn morning. Welcome back to Fall Baking Week. 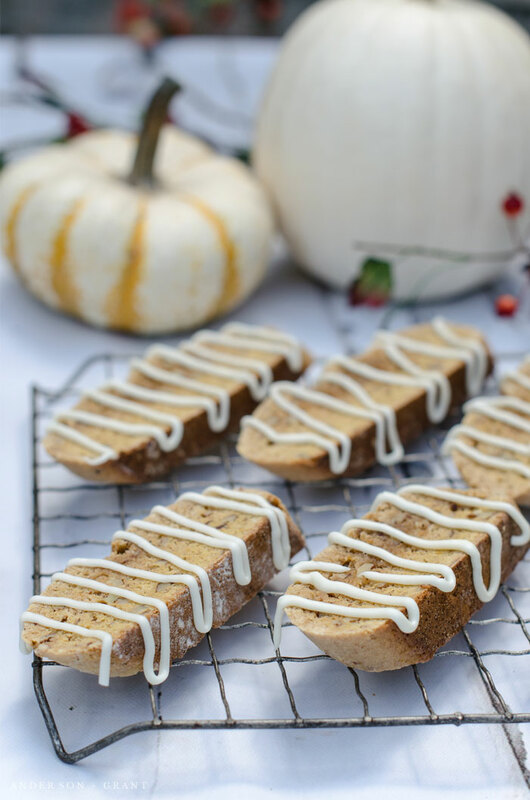 All week I've been sharing some of my favorite cake and cookie recipes for autumn and today I've chosen one of my favorite types of baked goods....biscotti. Links to all the other recipes for the week appear near the end of this post. 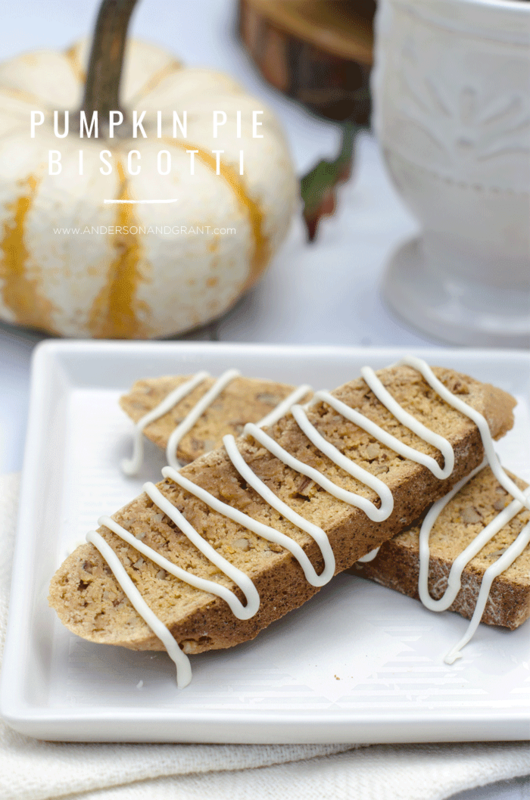 In my opinion, biscotti is one of those "special" types of treats that you sit down and savor. It is a cookie that takes a bit more time and work to prepare than a chocolate chip cookie or brownie. If you've never made biscotti before, it is a cookie that is actually baked twice....once as a log of dough and then a second time when it is sliced. 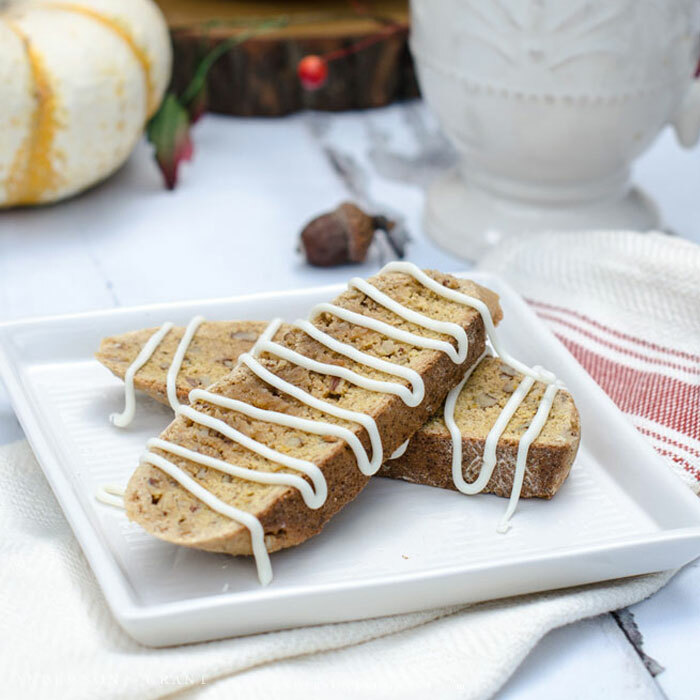 Needless to say, when I get the opportunity to eat some homemade biscotti, I like to take a bite, close my eyes, and enjoy the flavor. Melt butter in a large skillet over medium heat. Add the pecans and cook until they have browned, stirring constantly so that they do not burn. Remove the pan from the heat and cool the nuts completely. In a medium bowl, whisk together the flour, baking powder, salt, and pumpkin pie spice. In another bowl, whisk the eggs, brown sugar, pumpkin, and vanilla together. This is done most easily using an electric mixer on medium speed until the mixture thickens, about 2 to three minutes. Slowly stir the flour mixture into the egg mixture using a rubber spatula. Your batter will be quite crumbly. Fold in the pecans. On a lightly floured surface, divide the dough in half. Shape each half into a 3x10 inch log. Place both logs on a baking sheet that has been lined with a nonstick liner or parchment paper. Dampen your hands and then smooth and shape the surface of the two logs. Bake the two logs until they are slightly firm to the touch, about 25 to 30 minutes. Remove the baking sheet from the oven and turn down the oven temperature to 300 degrees. Let the logs cool on the baking sheet for 15 minutes. Transfer the logs to a cutting board. With a serrated knife, cut each log diagonally into slices that are 1/2 inch thick. The inside of the biscotti will still be soft and moist, while the outside crust will be hard. Place the cookies cut side up in a single layer on the baking sheet. Bake the slices until the biscotti are firm, about 20 minutes total. You'll want to flip the slices halfway through baking. You can adjust the cooking time based on how crunchy you want the biscotti to end up. Let the biscotti cool completely on a wire cooling rack. Later, melt the white chocolate, and drizzle the chocolate over the top of the cookie. I put mine in a zip top bag and cut the corner off. You could also just dip the biscotti into the melted chocolate if you don't want to have the drizzle. 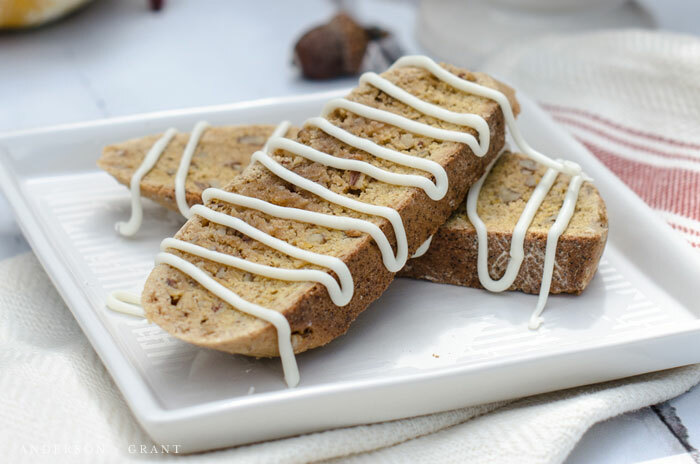 This biscotti tastes best during the first few days after you make it. It will keep for up to a month in a sealed container, but I like to stick mine in the freezer to preserve the freshness. 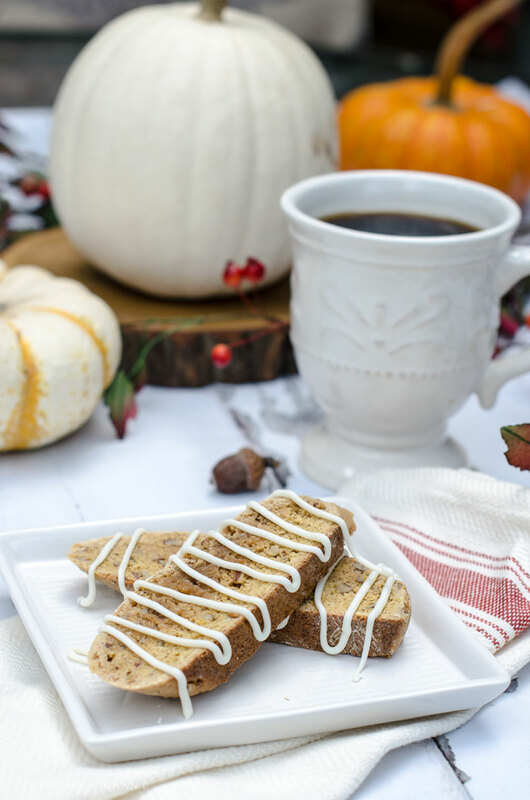 Whether you enjoy dunking your biscotti in your morning coffee or you like eating it straight off the plate, I think you will find this recipe makes the most delicious fall treat. Enjoy!